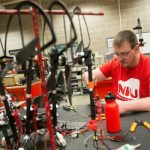 The engineering building at Northern Illinois University was a hive of activity and innovation on the Friday before finals, as graduating seniors presented their capstone Senior Design Projects. Thirty-seven student groups presented their designs to improve everything from factory workflow to a morning cup of coffee, and nearly two dozen faculty, industry and alumni judges rated the presentations in each department. 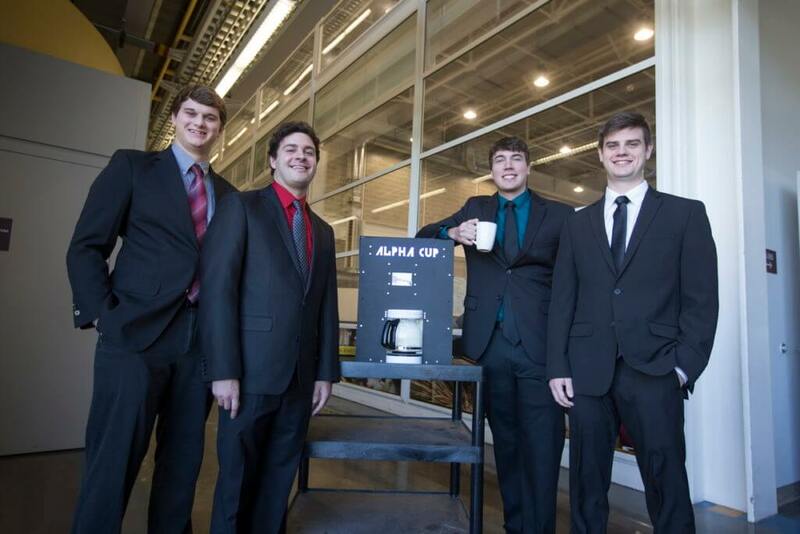 NIU engineering students (from left) Jake Klein, Dennis Grekousis, Eric Morgensen and Andrew Poull took top honors among mechanical engineering projects at the Senior Design Day competition with their new and improved coffee maker, Alpha Cup. In a surprise upset, the Structural Harness for Enhanced Load Lifting, or SHELL, received the Engineering and Technology Alumni Society Excellence Award, despite coming in second in the mechanical engineering department behind the Alpha Cup and the Community Gardens Automated Irrigation System, which tied for first. Fittingly enough, the Alpha Cup and Community Gardens teams shared a fundraising table throughout the semester, with the Alpha Cup team selling coffee and the Community Gardens team selling waffles. The irrigation project identified a more efficient way to provide irrigation to the community garden on campus. Rather than watering on a timer like standard automated irrigation systems, the team devised a system that waters only when the soil moisture is low, reducing water consumption by 60 percent. The team consisted of Alexa Mathias of Oak Park, Kayla Ruppe of Mettawa, Coralyn Saxby of Pecatonica and Robert Zill of Burr Ridge. The Alpha Cup team developed a coffeemaker that brews anywhere from one to 12 cups of coffee without generating any waste other than the coffee grounds. The machine automatically measures fresh grounds and dumps used grounds out of the mesh brewing basket into a waste bin. It also runs brewed coffee through cooling tubes so it is dispensed from the machine ready to drink. The team included Dennis Grekousis of DeKalb, Jake Klein of Sycamore, Eric Morgensen of Pecatonica and Andrew Poull of Oak Forest. All six industrial and systems engineering teams worked on projects sponsored by companies that asked the students to solve real engineering dilemmas. The winning team in the industrial and systems engineering division analyzed how Woodward could integrate a repair and overhaul space into its assembly line area. The team came up with a plan that is estimated to free up more than 300 square feet of floor space and reduce overtime by nearly 1,000 hours, saving the company up to $90,000. The two-man team consisted of Jakob Linder of Winnebago and Adam Ludewig of Rochelle. The winning electrical engineering project also had a corporate sponsor. The IoT Chiller replaces RePaCo’s old chiller controller with a new controller that makes use of the Internet of Things. The Internet-connected system allows the company to monitor the chiller off-site and gives essential data so the company can plan for shutdown and maintenance. The team made the system modular and used the company’s existing sensors to reduce the costs of both implementation and future maintenance. Students on the team were Kyle Platt, Andrew Orosz of Countryside and Tyler Sukel of Lake in the Hills. The winning project in the technology division also makes use of Internet connectivity. The Human-Centric Wearable Sensor array is a discreet box roughly the size of a company ID and designed to be worn in the same manner. The device packages a variety of sensors that communicate with a smart building to control environmental factors such as temperature and lighting, giving individuals more control over their working conditions. Such technology could make workspaces more energy efficient and workers more productive, at a cost of less than $80 per unit. 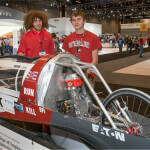 Daniel Timmer of Crystal Lake and Keith Scullans of St. Charles made up the two-man team behind the project.